Slow food is an international movement created in 1989 to promote the local food cultures. 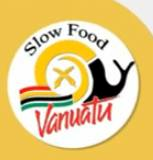 This short film produced by VKS productions focuses on the Vanuatu food production, preparation and consumption. In Melanesia, it's a whole culture and social organization that is developed around the local food.